Fundraising work: Cha Cha, the golden retriever with author Lisa Stephens and illustrator Declan Smith at the launch of a new book at St Columba’s School. PREPPIES at St Columba’s School, Wilston, were delighted to welcome some special guests to their library for the launch of a book that will benefit Guide Dogs Queensland. 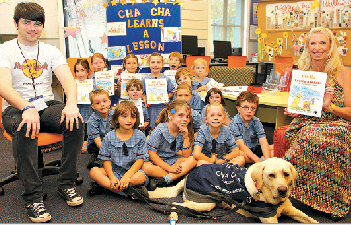 The 20 lucky Preppies met author Lisa Stephens, illustrator Declan Smith and golden retriever Cha Cha, who is the star of their latest book Cha Cha Learns a Lesson. Cha Cha, who was trained by Guide Dogs Queensland, is now retired and living with Lisa and her family, but is still an ambassador for the organisation. Lisa’s books follow the adventures of Cha Cha and his two friends imparting simple little life lessons to children between the ages of two and seven. She said $5 from the sale of every book is donated to Guide Dogs Association of Queensland to help train future guide dog puppies. She has already published two books: Cha Cha and the Picnic Basket and Cha Cha and the Great Cricket Match, and this is the third in the series. The books were illustrated by Declan, a former student at Marist College, Ashgrove. Using watercolour and ink, Declan illustrated the books while still a student at Marist College, following a recommendation to author Lisa by his art teacher. The 18-year-old said he worked closely with Lisa on the books and used his own two dogs as inspiration for his creations.